Open up a dictionary, and under the definition for ‘class’ you’ll probably find a picture of a Bugatti. These are cars that generally radiate elegant beauty through their sleek curves and undeniable speed. But… not everyone can always be perfect all the time. Case in point: the 1923 Bugatti Type 32. Aka, The Tank. It’s not the most visually appealing car in the world, but it was something of an engineering marvel of its day. Think of other cars from the early 1920s. They tended to be clumsy-looking and boxy, or plain ol’ cigar-shaped; they were big, angry, heavy machines. This was an era before we knew all those fancy aerodynamic terms. Back then, people weren’t as inclined to think “downforce” as they were “well it’s top-heavy but it goes fast”. Unless, of course, you were Ettore Bugatti. According to Hemmings, the Tank was an early experiment in aero. If the shape of an airplane’s wing provides an upward force, then why don’t we reverse that shape on our race car body? A streamlined car won’t have those extra bits that catch in the wind, and it’ll be nice and stuck to the ground. From our standards today, we probably wouldn’t see the Type 32 as being particularly, uh, artistic. But back in its day, it was a real show-stopper. 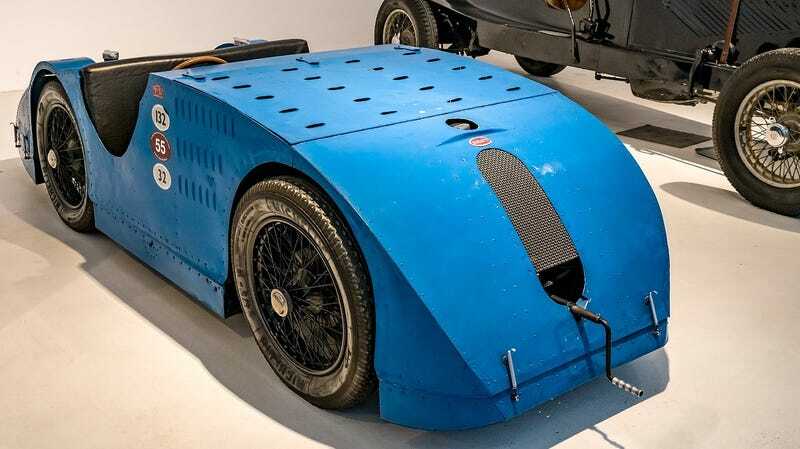 Curving all that metal seemed like an exercise in excess, but Bugatti was one of the first to try to make it work. The Tank was originally designed with the specific intention of winning the 1923 French Grand Prix. A French marque competing against the likes of Fiats, Sunbeams, Voisins and Delages, Bugatti was fiercely determined to create a car that was going to steal the show and cement his brand as being the most competitive in the world. Bugatti drew on the Type 30 road car for some of the Tank’s basic components. The chassis and inline-eight engine with a two liter capacity were the same across the board between the two. It provided a solid starting point for a little extra experimentation. Almost more interesting than the shape itself—but less noticeable, being hidden behind the curving body—were the front brakes. They featured a hydraulic assist, which was pretty much a first in the world of motorsport. The only problem was, there was no brake pedal. Drivers had to use a lever in an already-cramped cockpit. The race, though, was fruitless. Bugatti hadn’t done much with the engine, and using an outdated model in competition against the supercharged Fiats was never going to work. It was only through the retirement of all three of their entries and a last lap spin by the driver of the third place Sunbeam that the last remaining Bugatti on the circuit was able to steal a podium position. In addition to the underpowered engines, the Tank just wasn’t low enough to the ground. The fact that a significant amount of air could still get underneath the car meant that as soon as a driver started cruising at a high speed, he started generating lift. Not exactly a comforting feeling when you’re trying to push the limits of speed. Despite the car’s failure in its task, the Type 32 started to kick off some changing times in racing. Now, manufacturers were wondering what they could do with that odd, curving shape or that fancy braking system. Ettore Bugatti simply used the basis of his design to craft the Type 35—a car so successful it finally earned the man behind the marque the renown he’d been seeking.